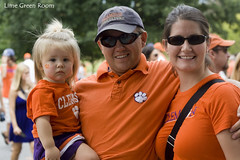 ClemsonGirl.com has partnered up with one of our fave upstate photographers, Rachael from Lime Green Room Photography, to find the tailgate of the week for the Clemson vs. Auburn game. 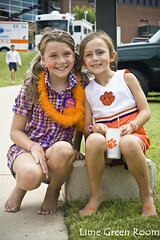 Lime Green Room Photography would like to give a very lucky ClemsonGirl.com reader a tailgate photo shoot. 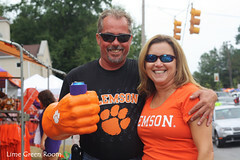 Rachael will come to your tailgate in Clemson on Saturday and do a mini photo shoot (exact time of photo shoot to be arranged between winner and Lime Green Room Photography). You'll later receive a free CD from Lime Green Room Photography with all of the images. We will also feature you and your photo shoot next week on the blog! It doesn't matter if you tailgate in a multi-tent group, with your family under one tent, or with a group of friends in tailgate chairs behind your car...if you will be tailgating at the Clemson vs. Auburn game this Saturday in Clemson, then you are eligible for this giveaway! This is an amazing prize - just imagine the fun and spirit of your Clemson tailgate captured in photos for you to display year round. All photos will be property of Lime Green Room Photography and will be shared on Lime Green Room Photography's website and Facebook page. A CD of the images will be given to the winner to use as the winner wishes. Post a comment on this blog with your first name, last initial, and where you are from (1 entry). 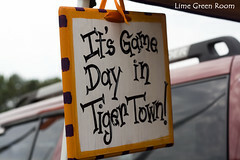 'Like' Lime Green Photography on Facebook and post "My tailgate is photogenic!" on the Wall (1 entry). Share this giveaway on Facebook with all of your friends, then post another comment letting us know you shared (1 entry). 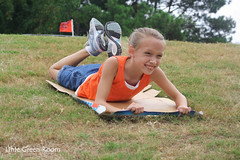 Tweet about this giveaway on Twitter - include a link to this post and @clemsongirl (1 entry). Email a link to this giveaway to two friends and copy us, clemsongirlblog@gmail.com (1 entry). Deadline for entries will be NOON EST tomorrow, Wednesday, Sept. 14th. We will announce the winner Wednesday afternoon. The winner will have until NOON on Thursday, Sept. 15th to contact us or we will draw and announce a new winner -- this is a shorter turnaround, but because of the timeliness of the prize, we need to hear immediately from the winner. If you enter, please return to the blog Wednesday evening to see if you've won. 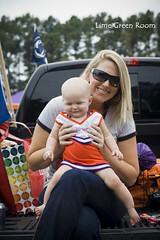 We cannot wait to see the photos of the Clemson vs. Auburn Tailgate of the Week! Special thanks to Lime Green Room Photography for sponsoring such an awesome giveaway! Also posted to Facebook!! My Family would LOVE this! I'd love to have this occasion commemorated with fabulous pics! That would be so much fun!! I have some out of town friends coming to this game, so the photo shoot would be awesome!!! I also shared this on FB and liked Lime Green's page! Cindy Mc Gaffney SC I would be one happy person in orange if you would come visit me!!! Cindy Mc Gaffney SC....would love to CU on Saturday!!! My friends on FB are ready to CU soon!!!! I shared on Facebook!!! (& liked their page) Would love to win this as I'm usually the one taking the pics and rarely in them!!!! Atlanta, GA - GO TIGERS!! Generational Tailgate with past and present clemson tigers! Just posted the link on my facebook! Can't wait! Big Tailgate in Lot 6 with four generations of family and friends. The men will be decked out in solid orange and the women will be sporting their very own hand crafted Clemson bling. Come join us for mimosas and good times!